There are so many jailbreak tweaks which are available on the internet. And Fr0zen Sun has now developed a new jailbreak tweak after the release of iOS 5.0.1 untethered jailbreak. He is not very popular but some of his popular tweaks are IconCommands, SBStickyNotes and few others. Details below! 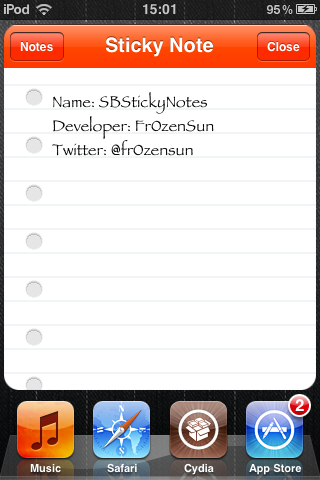 SBStickynotes offer users to create and 'stick' notes on the main screen. It is not easy to develop for a iOS device as a normal computer. But Fr0zen Sun has overcome this problem and has produced a tweak which can extends the functionality of iOS notes application by hooking directly to it and adding an option that allows notes to be pinned directly to the Springboard. The title is pulled directly from the top line of the note by the icon and added under the Springboard selector. Users are going to tap the icon where a note will pop up which will be animated with the text displayed in a window. A preferences entry is present which allows the users to use RGB values to get hold of the animation speed and allow to change the tint. The tweak is available for free on Big Boss Cydia repository and requires iOS 5 or higher. Thanks to all the developers for making these jailbreak tweaks for after releasing the iOS 5 untethered jailbreak. 0 Respones to "SBStickyNotes: Add Notes on iPhone’s Springboard"